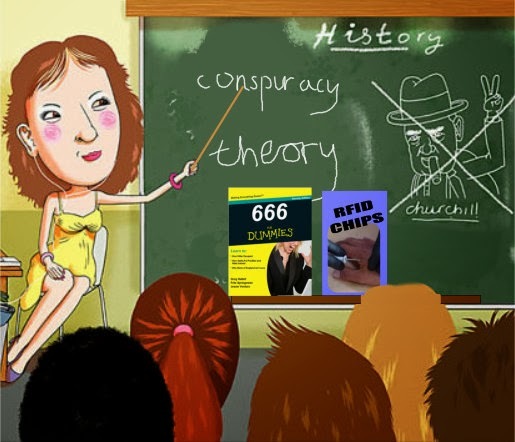 Here's my take on "Conspiracy Theory" so far, and it's like working backwards if you like. Tunneling backwards from my safe position in Christ to see, or try to see more of how the "independent self" doesn't actually work, because to even bolster its existence it has to manipulate everything. So I hope I am working forensically and in quite a matter of fact way, and not in the spirit that is itself "in separation" and to try to bolster its own sense of lack of self worth hunts down the wildest and wackiest things imaginable just to be attention seeking. because THAT spirit is definitely manifesting in other Conspiracy hunters. Here is something that is suspicious among the people of God though concerning this whole realm and it is related to another spirit. Jesus confronted that spirit in folk he met that wouldn't accept the anointing upon Him as a prophet. And He did it this way. He said, "you all think you support Moses or the other prophets but the reality is you couldn't do, because My Message is from the same Spirit as theirs was, and you don't accept that. So if Moses and Elijah were around now, you deceive yourselves, because if you don't accept Me then you certainly wouldn't accept them either." So, do you get Jesus argument here? So this is a similar Spirit train of thought concerning so called Conspiracy Theory. While I am prepared to admit some of the matters being shared might simply be hogwash, or vastly overexaggerated, those in the Christian church who speak most vociferously against conspiracy of any kind NEVER EVER PREACH on PSALM 2, and their silence says it all. To honour that section of the Word of God, would immediately open up the whole subject , so in dishonour of God's Word they prefer never to touch psalm 2. The fact is this. Most in the churches who are nay sayers about conspiracy, had they been around for the day of resurrection would also accuse those sharing about Jesus return to life...as the same sort of conspiracy. Why? Because it contains the very same sort of highly questionable material (from the human official standpoint) concerning the events of the trial, and also the fact that on Easter Day a crack Roman Legion suddenly are supposed to have fallen asleep, when normally just one person doing so on duty would mean instant death. So, when Christians kick up about the two issues 1. the prophetic subject of the third level Christ is bringing His church into and 2. the converse opening up of the secrets of how this world of Darkness actually runs by those of the "sons of Issachar" exposing bent....I just laugh...because are they supplying any Word in response? Is anything valid coming out of their mouths in the Spirit concerning these issues that may throw light or balance? NOPE...not a bit of it. Just reaction. In the same way so many of us were used to from Anglican Vicars or denominational Christians concerning the baptism of the Spirit 40 years ago. They get angry as if we seem to be ignoring them. We're not ignoring them, but we've been through all this before over 40 long years. That is nothing of substance comes from them just awful silence or quick change of subjects or reaction.